Sometimes things don’t go quite as planned. Perhaps your last job was going along smoothly (or so you thought)—and then—you were fired. While you can certainly mourn the job loss and examine why it happened, the next step is clear—you have to find a new position. So, where do you start? Follow the steps below to be well-on-your-way to your next job opportunity. Tip #1 – Don’t wait around. Being fired can take an emotional toll on you and it is extremely tempting to take some time off and assess the situation. However, have you ever heard the saying that it is easier to find a job when you have a job? The saying is true. Being ‘out of the game’ for any length of time means it’s more difficult to get back into the swing of things when the time comes for a new opportunity. So act fast. Tip #2 – Commiserate with a trusted friend or colleague. When you are fired, it can drain you emotionally. Now is NOT the time to vent on your social media accounts or tell everyone how poorly the company treated you. If you need to chat with someone, then do it in private. Find a trusted friend or colleague with whom you can share your story, tell them your feelings, and discuss the future possibilities. Don’t burn bridges, as it may be that very bridge you need to lead you to your next job. Tip #3 – Reach out to your network. Now, hopefully you have already been building your network and connections while you were employed. Building goodwill with people in your industry and within your circles of influence is an important key whether you have lost a job, been fired, or just want a new opportunity. 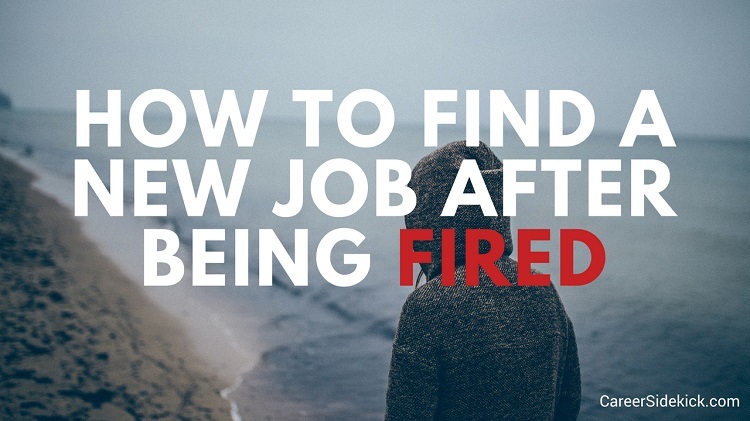 When you are fired, it is even more important to reach out to these connections and let them know you are looking for a change. Tip #4 – Be ready with an explanation—but not a detailed play-by-play story. Employees lose jobs all of the time—for a variety of reasons. Companies downsize, restructure, and regularly change personnel. There is no ‘rule’ stating that you have to provide all of the details for the job loss. Simply stating that the company downsized, your role was eliminated, or the company readjusted its workforce is enough explanation. And, the company is not likely to share the details either for fear of legal retribution. Tip #5 – Maintain a successful attitude. Getting fired can take the wind out of your sails, both personally and professionally. Use this time to adjust your mindset and read books that shift your perspective. While it can be challenging to keep this positivity, remember that you are not the only person that has been fired nor will you be the last. Instead, think of how this experience will shape your future and how you can share this as an example of resiliency. You can also use this time to build a new skill that you haven’t had time for while employed. Tip #6 – Surround yourself with positivity. Often, if you were fired, you may not have been the only one let-go from the same workplace. If you are professional colleagues with your former co-workers and they want to get-together to share job-searching best practices or ways to find new opportunities, that is one thing. If they choose to get-together and complain about being fired and how poorly-managed the company was, that is a completely different thing. Connect with positive people that are looking to the future and want to better themselves. If you consistently surround yourself with negativity and reminders of this not-so-great incident, then you will be dragged down even further. Tip #7 – Volunteer. Get involved with local organizations that allow you to hone your skills, give back to the community, and build relationships with organizational members. Try to find something that uses the skills you built in your previous job. This allows you to fill your new free time, make a difference in the area, and meet others that may be able to lead you to a new job opportunity. Tip #8 – Ask for recommendations on LinkedIn. Chances are that you were fired by one person. The good news is that there are probably a LOT of other people out there that know your skill-set, trust you as a colleague, and have recognized your superb work ethic. Ask your connections for a testimonial on LinkedIn to enhance your social media presence. One note about asking for a recommendation or testimonial: be specific. Don’t simply ask for someone to say nice things about you. Instead, say, “Hi Bob! You may or may not have heard that I am seeking a new job opportunity. I’m building my presence on LinkedIn to secure my new role. I enjoyed working on ___ project with you and would appreciate it if you could write a few sentences as a LinkedIn recomendation about my ___ skills. I’m happy to do the same for you, just let me know. Thanks!” When you are specific, it takes the guesswork out of the testimonial for the writer. If you need more info on how to approach people for recommendations (and who to approach), read this article on how to get great LinkedIn recommendations. Tip #9 –Treat finding a new job as if it is your job. Looking for a new position can be its own job, and if you want to find a position quickly you should look at it this way. Keep track of everything so you know and can measure your progress. Develop a list of where you’ve been applying for jobs, create a spreadsheet to track responses, and maintain a file so you know who you asked for a testimonial. Include dates and a plan for follow-up in these documents. Finding a new job can be challenging for anyone. However getting fired adds even more emotional stress to the job searching process. By implementing the tips listed above and remaining positive, you will be well on-your-way to a new job opportunity.